The U.S. Supreme Court has increasingly relied on dictionaries and numerous articles have discussed the persuasive value of dictionaries to construe statutes, contracts, and patent claims. Despite this extensive theoretical literature, a dearth of scholarly literature remains on the efficacy of thesauri in the legal framework. This article discusses the value of thesauri, in conjunction with dictionaries, as persuasive secondary sources to ascertain the plain and ordinary meaning of words and phrases. Based on empirical research, this article examines the frequency of opinions that cite to thesauri from 1990 to 2006. The article also provides a review of opinions where courts found thesauri persuasive and unpersuasive in construing statutes, regulations, and contracts. 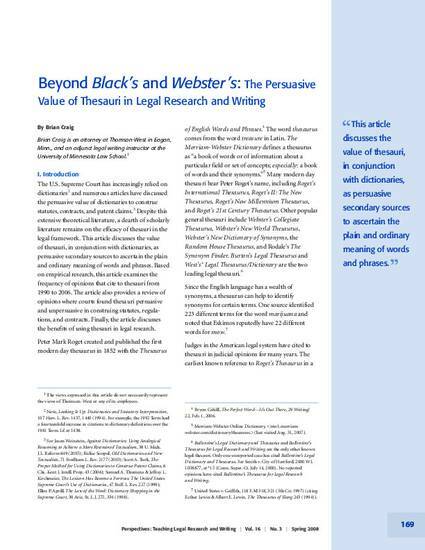 Finally, the article discusses the benefits of using thesauri in legal research.